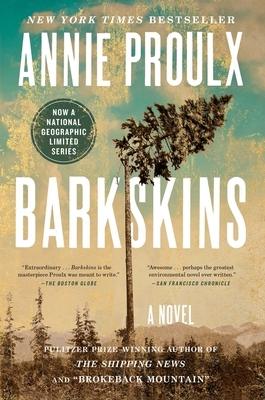 From the Pulitzer Prize-­­winning author of The Shipping News and “Brokeback Mountain,” comes the New York Times bestselling epic about the demise of the world’s forests: “Barkskins is grand entertainment in the tradition of Dickens and Tolstoy…the crowning achievement of Annie Proulx’s distinguished career, but also perhaps the greatest environmental novel ever written” (San Francisco Chronicle). In the late seventeenth century two young Frenchmen, René Sel and Charles Duquet, arrive in New France. Bound to a feudal lord for three years in exchange for land, they become wood-cutters—barkskins. René suffers extraordinary hardship, oppressed by the forest he is charged with clearing. He is forced to marry a native woman and their descendants live trapped between two cultures. But Duquet runs away, becomes a fur trader, then sets up a timber business. Annie Proulx tells the stories of the descendants of Sel and Duquet over three hundred years—their travels across North America, to Europe, China, and New Zealand—the revenge of rivals, accidents, pestilence, Indian attacks, and cultural annihilation. Over and over, they seize what they can of a presumed infinite resource, leaving the modern-day characters face to face with possible ecological collapse. “Monumental. [With] prose of directness, clarity, rhythmic power and oaken solidity. . . Barkskins is a potently imagined chronicle of mankind’s dealings with the North American forests." “Annie Proulx – the magnificent American writer who brought us ‘Brokeback Mountain’ and ‘The Shipping News’ – scores once again with the captivating ‘Barkskins.’ . . . Her prose is often glorious, her several protagonists unforgettable. Proulx taps a vein here, helping to make ‘Barkskins” one of the most exciting books I have read in years. Proulx has pulled out all the stops." "Barkskins leaves no board unturned as it covers the industry that brought us plywood, cheap paper and prefab housing. [With] Proulx’s stunning stylistic gifts . . . She is a writer’s writer, and one whose deep interest in history provides the long view of how our environmental recklessness has brought us to a point of reckoning." “An epic capstone to 80-year-old Proulx’s impressive career, Barkskins surpasses even the extraordinary The Shipping News as her finest novel."